-Bath (baño): I'd like to have a single room with a bath for two nights (Quiero una habitación individual con baño por dos noches). 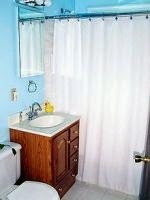 -Bidet (bidé): In the bathroom there's a sink, a bidet, a toilet, and a shower. There used to be a bath (En el baño hay un lavado, un bidé, un inodoro y una ducha. Antes había una bañera). -Cold water (agua fría): As the bath is too hot, I will run some cold water into it (Como el baño está muy caliente, le echaré algo de agua fría). -Comb (peine): This is a wooden comb (Es un peine de madera). -Drain (drenaje): The drains are blocked up (Los drenajes están obstruidos). -Faucet (grifo): Carl turned on the water faucet, but nothing came out (Carl abrió el grifo, pero no salió nada). -Hot water (agua caliente): Run hot water into the bath (Echa agua caliente a la bañera). -Shower (ducha): I usually take a shower in the evening (Usualmente tomo una ducha en la noche). -Toilet (inodoro): I run to the toilet every thirty minutes (Voy corriendo al inodoro cada treinta minutos). -Toilet paper (papel higiénico): We have a stock of toilet paper (Tenemos reserva de papel higiénico). -Tub (bañera): The boy splashed about in the tub (El chico chapoteaba en la bañera).